Denver may be a world-class metropolis with all the familiar urban sights and sounds, but no matter where you find yourself in the city, you’re likely to be only a few steps away from a lush and relaxing green space. The Mile High City boasts more than 5,000 acres of traditional parks and parkways, which include 2,500 urban natural acres and over 300 acres of parks designated Rivers & Trails, plus an additional 14,000 acres of spectacular mountain parks in Clear Creek, Douglas, Grand and Jefferson County that are maintained by the City and County of Denver. Here’s a look at a few favorite parks in Denver. On the corner of 16th and Arapahoe streets. Adjacent to the 16th Street Mall, Skyline Park offers an easy getaway for the more than 120,000 people who spend their workday in downtown Denver. Located at 15th and Arapahoe streets, Skyline Park is always a fun place to spend a little time, especially during the summer, when visitors to the Skyline Beer Garden can enjoy brews on draft, street food, a family-friendly game area and live music on Friday and Saturday nights. And don&apos;t miss the Downtown Denver Rink at Skyline Park every winter, offering free ice skating all season long. 101 W. 14th Ave. Pkwy. Located in the heart of downtown Denver, Civic Center Park is always bursting with life, as tourists and locals take advantage of the beautiful landscaping and vibrant atmosphere of this unique urban park. Many events, such as Cinco de Mayo, Civic Center EATS (a food truck festival Tuesdays, Wednesdays and Thursdays in the summer months), the Capitol Hill People&apos;s Fair, Denver PrideFest, Martin Luther King Jr. Day and A Taste of Colorado are traditionally held in Civic Center Park. This spacious plaza, surrounded by monumental government and public buildings, is a stone&apos;s throw from a number of Mile High City attractions, including the Denver Art Museum, the Denver Public Library, the 16th Street Mall and the Colorado State Capitol Building. 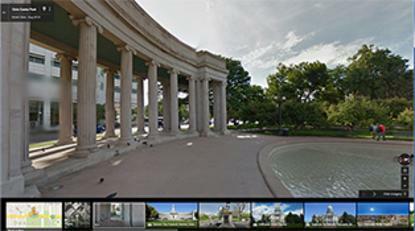 Click on the image below to take a virtual tour of Civic Center Park via Google Street View. City Park features a public golf course. Where Cherry Creek and the South Platte River meet and mingle, you&apos;ll find the unique and scenic Confluence Park. Watch kayakers brave the rapids on custom-designed chutes, sunbathe on the sandy banks and enjoy panoramic views of downtown Denver. The park is close to the Downtown Aquarium, the Children&apos;s Museum of Denver at Marsico Campus and Elitch Gardens Theme & Water Park. Hop on the Denver Trolley and take a 30-minute scenic ride along the river, plus learn about the area&apos;s history. Love a party? Join thousands of revelers at the South Platte RiverFest each June for water sports and live music. Just steps away from Elitch Gardens Theme & Water Park and the South Platte River, the Centennial Flower Gardens are a must-see for anyone with interest in gardening. The gardens are patterned after the Gardens of Versailles, with paths and patterned flowerbeds showcasing native species along with other flowers that grow well in Colorado&apos;s arid climate. This is a great spot for a refreshing afternoon stroll. 15th and Little Raven streets. Commons Park can be found on the banks of the South Platte River in a spot that just happens to be the city&apos;s birthplace. It&apos;s a pleasing mix of natural and urban influences: Close to 40 percent of the park is covered by native plants, a piece of reconstructed lush "sand prairie" reminiscent of what would have existed in the area originally. Meanwhile, the promenade along Little Raven Street is a tree-lined walkway dotted with many seating areas and entries to connect the park to downtown Denver. East of downtown on 17th Ave. and York St. This expansive, multifaceted park is Denver&apos;s version of New York City&apos;s Central Park. In City Park&apos;s 330 lovely, landscaped acres, you&apos;ll find a public golf course, colorful flower gardens, ornate fountains, placid lakes and rolling green lawns perfect for picnics. City Park is home to some of Denver&apos;s most popular attractions, including the Denver Zoo, the Denver Museum of Nature & Science, the Martin Luther King Memorial and much more. From June through August, the park plays host to City Park Jazz, with free concerts each Sunday. It&apos;s also got unbeatable views of The Mile High City skyline and the Rocky Mountains beyond. Winter in Washington Park. Enjoy the parks year-round. An orchestra performs at the City & County building overlooking Civic Center Park and the State Capitol Building. Joggers love Cheesman Park for the crushed granite jogging path that winds its way around the park. But it&apos;s also a popular spot for families, thanks to its large playground with swings, slides and everything else to delight your young ones. The park, located at Franklin St. and 8th St., also offers incredible vistas stretching from the Cheesman Memorial Pavilion to the Front Range. Bordered by Virginia Ave. on the north, Downing St. on the west, Louisiana Ave. on the south, and Franklin St. on the east. One of Denver&apos;s most popular spots year-round, Washington Park (nicknamed "Wash Park" by locals) features two lakes (boat rentals are available), flower gardens, innovative playgrounds and countless areas for outdoor recreation. Wash Park is also a favorite for its extensive sports and fitness options, including a recreation center with indoor pool, a bicycle/pedestrian pathway, a crushed granite jogging path, a fitness course, a horseshoe pit, a lawn bowling/croquet area, a soccer field and tennis courts. 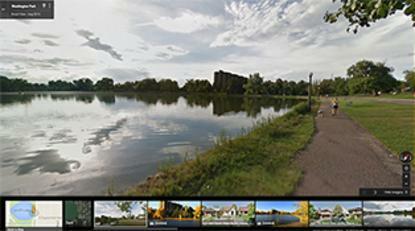 Click on the image below to take a virtual tour of Washington Park via Google Street View. Located in the Highlands neighborhood of Denver, Sloan&apos;s Lake Park is an urban oasis, with the enormous Sloan Lake taking center stage. In the summer, keep an eye out for water skiers zooming across the lake, framed by a stunning view of the Denver skyline. Bring some food to grill and spread out a picnic blanket or two — there&apos;s plenty of room at this 177-acre park. Sloan&apos;s Lake Park hosts the annual Colorado Dragon Boat Festival, a celebration of Asian American culture and tradition featuring a host of ornate dragon boats filling the lake. Escape from the hustle and bustle of city life at nearby Bear Creek Lake Park in Lakewood. With 2,600 acres of unspoiled natural beauty, Bear Creek provides hiking, mountain biking and horseback riding trails; a swim beach and marina with boat rentals; picnic, playground and recreational facilities; and fishing and camping. You can also reserve a pet-friendly cabin or yurt for larger groups!